Sam’sClub.com- Shipping price is based on state and weight of the order. Plus members get free shipping on most items with no minimum. -Occasional free samples are available online, in store through employees, or in-store are kiosks. Unless otherwise noted, these are in store free samples. Read articles regarding free samples: Blue Stop Max Massage Gel For Body Aches. -Join for $45 a year or $100 for a premium membership (which is what I have). Get a $20 e-gift card when you join online. The basic membership gives access to purchase anything sold in the store. With the premium membership, you get an annual rebate (based on purchases), added discounts on select items, incredible discounts in the pharmacy, extra shopping hours, and much more. -Get a Free Sample Pack for Infants, Toddlers, Preschoolers, or Elementary Aged children. 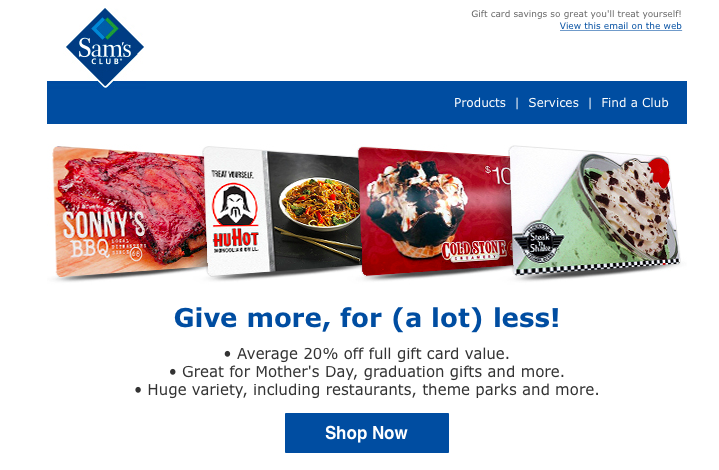 -The perfect place to buy gift cards. Never pay full retail.